According to China’s Ministry of Human Resource report, 6.99 million students will graduate from higher education institutions of the country this year. It’s the biggest batch in the history of China and 190,000 more compares to last year. People posting on internet that 2013 is the worst year to graduate in China. Many of the best universities in China are in Beijing, 229,000 students will graduate this summer and only 33.6% of them have got secured jobs. Only 26.6% of undergraduates and 36.59% of postgraduates have singed the final trilateral labor contracts (among schools, employees and employers) at the beginning of May. In order to slow down the population growth in Beijing, the opening municipal job positions for this year is decreased to 98,000, which is 16,000 less than last year, dropped 14%. It makes the situation even worse. Looking into the reason of the difficulty, first of all, it is attributed to the rapid expansion of college admissions. The number of fresh graduates this year is almost 7 times of the year 2000. It’s largely outpacing the country’s economic growth. There are enough job positions in the market, but it’s may be lower than the graduates’ exceptions. Most of them aimed at state-owned enterprise, public service unit and civil servants positions, but only very few get the offer. Secondly, overseas returnees give more pressures to the job hunting season. An increasing number of Chinese students born in the late 1980s have returned to work in China after finishing their studies abroad. 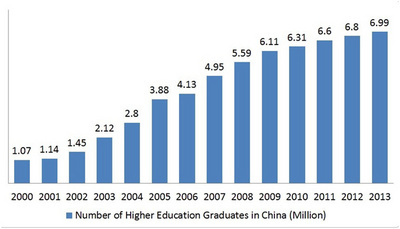 272,900 overseas graduates returned to work in China last year, 90,000 more than 2011. However, without relevant experience, overseas students are losing their advantages, and the situation isn’t really optimism to them either. At the same time, China’s GDP growth slowed down to 7.7% in the first quarter 2013, which is 0.2% lower than the last quarter of 2012(reported by National Bureau of Statistics of China). It has been slowing down since 2010. Even in good times, fresh graduates couldn’t get fully employed. With slower economic growth and less job positions, the college grads are facing even greater pressures. However, the reality may not as terrible as it is reported. There are still plenty of job offers in the market but Chinese universities have educated too many students and it exceed the demand of the job market. Many opening postions don’t require skilled employees and of course the salary is low, thus students wouldn’t chose them. Carline Xu, a friend of mine who graudated this year with a bachalor degree in Electric Automation; after 4 months of job hunting, she has finally found a coordinator job recently, with a month salary of RMB 2100 (≈USD 336) in a medium size city. Her job is not relevant to her major at all. Actually, most of graduates could find a job but may not be a really “good” one. This year, almost all the graduates are born in the year 1990, it is the first batch of 90’s generation. They are considered as the most fragile generation ever, because they were born and grown up during the decade that China had the most rapid economic growth. Their standard of life was largely improved compares to 80’s and 70’s and is the best so far. Most of them were provided with the best material benefit all their life and been treated as the little empires at home. However, at the moment they are about to step in the real world, they have to face the chanllege for the very first time. Hope they will adapt the reality soon and accept the fact that not everyone could have an ideal job.